Home › Features › USAF looks to push F-15C/Ds out to 2045! The USAF held an industry day at Warner-Robins ALC, Georgia, on October 13, related to the F-15C/D Wing Replacement Program. With 235 C/D models of the Eagle still in the inventory, the USAF is looking to push service life out to 2045 and new wings form part of a fleet viability program. The new wings will be based on the F-15E production wing and ‘shall be capable of flying 14 years at current worst usage severity prior to first depot level inspection, with a minimum of 7 years flying time between recurring depot inspections afterwards’. The winning contractor shall design/test/produce three production prototype wing sets (FY 2020) for 2 x F-15Cs and 1 x F-15D. This adds up as 240 wing sets for the F-15C/D Eagle community. Whilst recent Boeing fatigue testing indicates that new longerons and these new wings will be required to keep its aging Eagles flying, the manufacturer has also pitched capability upgrades under the so-called F-15 ‘2040C’, which is essentially a menu of options to keep the F-15C relevant out to 2045. The 2040C proposal initially seeks to address the F-15C’s weapons-carrying potential, with the ability to carry up to 16 air-to-air missiles, making it an ideal support act to the limited load potential of the F-22 and F-35. The 2040C would not, however, be able to carry these weapons in the same manner as Boeing’s new ‘Advanced F-15’. The addition of digital fly-by-wire (DFBW) on the ‘Advanced F-15’ opened up the potential for activating stations 1 and 9 on the outer wings. The new DFBW system is able to overcome the instability caused by the new stations. However, a non-DFBW Eagle, such as the F-15C/D, would not be able to benefit from the additional outer pylons unless it was suitably upgraded. Retrofitting DFBW to the F-15C/D would be a costly business, and the new wing solitication makes no mention of adding/activating Stations 1 and 9. 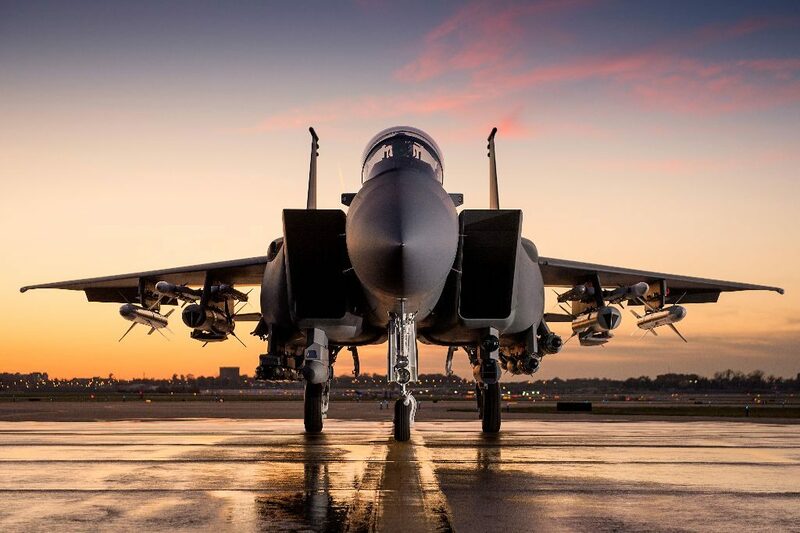 Therefore, the latest re-winging initiative appears to favor the Boeing offering for the F-15C to place four additional air-to-air missiles on new conformal fuel tanks (CFTs) instead, if up-arming the Eagle is on the USAF’s agenda. The Boeing artist’s impression of the ‘2040C’ (above) suggests the pylons would be very similar to the BRU-61 Universal Armament Interface (UAI) already carried by the F-15E community. It will be fascinating to see if the F-15 re-winging program does indeed pave the way to CFTs. The new wings will be based on the F-15E wing and the design ‘shall maintain the original mold line and existing fuselage interfaces’. Whilst the solicitation for the new wings makes no mention of activating stations 1 and 9, it does, however, make provision for the new Eagle Passive/Active Warning and Survivability System (EPAWSS), now on contract with Boeing and in flight-test. EPAWSS will literally sample the RF spectrum, identify threats, prioritize and allocate jamming resources against them. The new wings will be supplied and fitted wired for the new system.